Number of Interments and Memorials: 500? Open: Usually open to visitors from Monday to Saturday throughout the year. Hours vary, so check the daily schedule here: http://www.westminster-abbey.org/visit-us/opening-times. On Sundays and religious holidays such as Easter and Christmas, the Abbey is open for worship only. All are welcome to services. Admission: £16 for adults, £13 for students over 18 and seniors 60+, £6 children from 11 – 18 years old, children under 11 free if accompanied by an adult. Family discounts are available. Each of these entry fees includes the audio guide. King Edward (later called the Confessor) was born between 1002 and 1005, son of Saxon King Ethelred the Unready. He was chased from England by Danish invaders and lived in exile in Normandy, where he vowed to make a pilgrimage to Rome if he ever regained his throne. When he eventually returned to England, he was crowned at Winchester in 1042. The Pope released him from fulfilling his vow on the condition he would found a monastery to St Peter. Edward chose to replace the old Saxon church at Westminster with a new building in the Norman style. It was consecrated on Holy Innocents’ Day at the end of December 1065, but Edward was too ill to attend. He died early in January 1066 and was buried before the High Altar in his new church. The Bayeux Tapestry shows his burial procession. 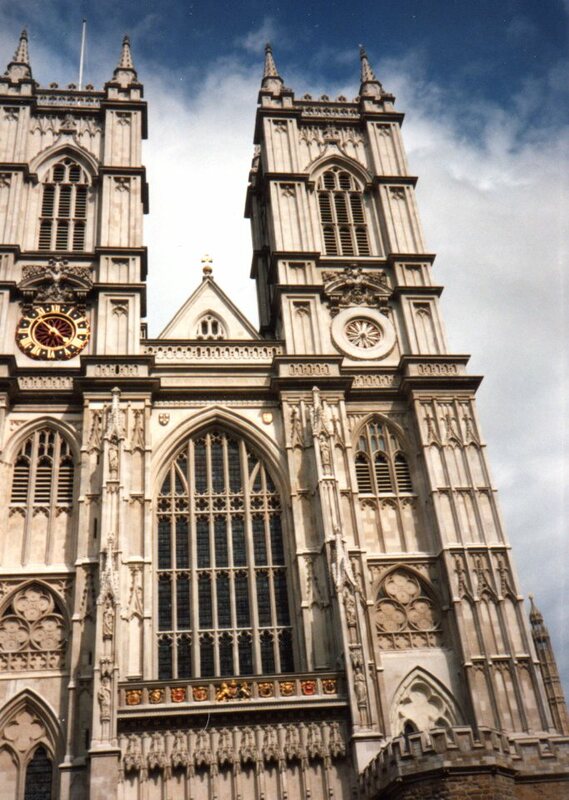 Westminster Abbey has served as the site of every British coronation since 1066. The tradition predates the modern Gothic building, begun by Henry III in 1245. The abbey is also stuffed nearly to bursting with mortuary sculpture, which it is –unfortunately – forbidden to photograph. The abbey’s website says, “Taken as a whole, the tombs and memorials comprise the most significant single collection of monumental sculpture anywhere in the United Kingdom.” Photographs of the monuments are available from the Abbey’s gift shop. Seventeen British monarchs reside permanently in the Abbey, ranging from Henry III, whose heart lies at Fontevrault Abbey in France amongst the tombs of his ancestors to Henry VIII’s fourth wife Anne of Cleves, and Mary, Queen of Scots. Protestant Elizabeth I shares a tomb with her older sister Catholic Mary I beneath an epitaph that says “Consorts both in throne and grave, here rest we two sisters…in the hope of one Resurrection.” Apparently, Elizabeth’s coffin was stacked atop Mary’s. Elizabeth’s effigy is the only one visible. 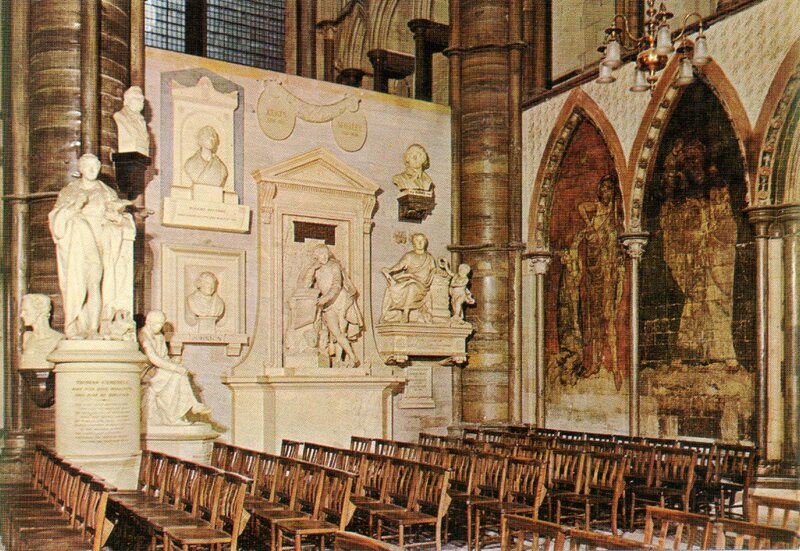 Commoners such as Geoffrey Chaucer, Rudyard Kipling, Charles Darwin, and Sir Isaac Newton were honored with burial in the Abbey. Charles Dickens was interred here against his will, rather than being allowed to be buried alongside his family in Highgate Cemetery. Composer Henry Purcell was buried in the abbey near the organ that he had played. George Frederic Handel requested burial in the Abbey in his will, since he had composed a hymn that is still used at every coronation. African explorer David Livingstone was offered burial in the Abbey after his death in Africa, so his attendants unearthed his body, embalmed it, and sent it back to England without its heart, which they reburied in his original grave. 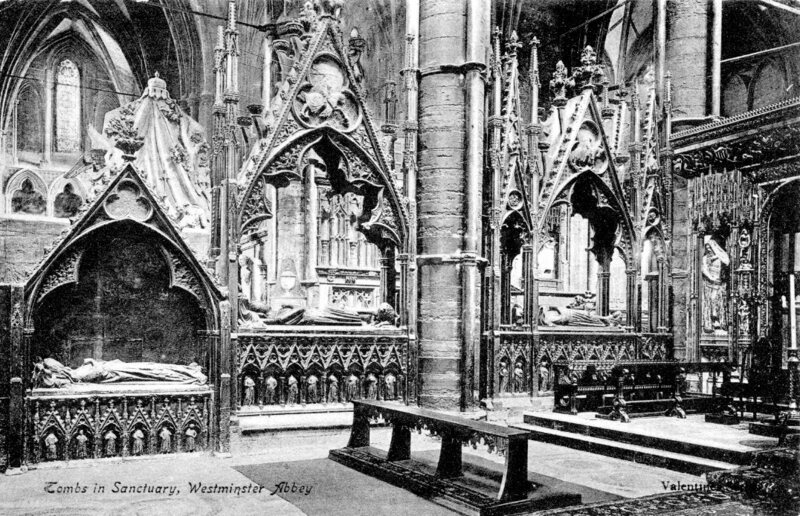 During the 20th century, coffins were no longer buried in Westminster. Actor Sir Henry Irving was the first to be cremated and have his ashes interred in 1905. Other famous Britons are commemorated in the Abbey, although their remains lie elsewhere. Among these are Shakespeare (buried in Holy Trinity Church at Stratford upon Avon), Jane Austen (buried in Winchester Cathedral), William Blake (buried in an unmarked grave in Bunhill Fields, London), Lewis Carroll (buried in Guildford’s Mount Cemetery), Sir Winston Churchill (buried with his parents in St. Martin’s Churchyard in Bladon), Shelley and Keats (both buried in the Protestant Cemetery of Rome), and many more. Some Britons were recognized many years posthumously with memorial plaques. Lord Byron’s memorial was placed in 1969. Oscar Wilde was recognized on a stained glass window unveiled on Valentine’s Day 1995. Poet and spy Christopher Marlowe received his acknowledgment on another panel in the same window in 2002, 500 years after his death. American poet Henry Wadsworth Longfellow was honored by a bust in the Poet’s Corner, the only American to be granted that honor. A statue of Martin Luther King Jr. stands in a niche beside nine other 20th century martyrs, including theologian Dietrich Bonhoeffer, who was executed by the Nazis at the Flossenburg Concentration Camp. At the west end of the nave lies the tomb of The Unknown Warrior. After the end of World War I, unidentified British servicemen were exhumed from graveyards in the Aisne, the Somme, Arras, and Ypres, then draped in the British flag. Brigadier General L. J. Wyatt, commander of British troops in France and Flanders, chose one, who was placed in a plain pine coffin. The others were reburied with honors. 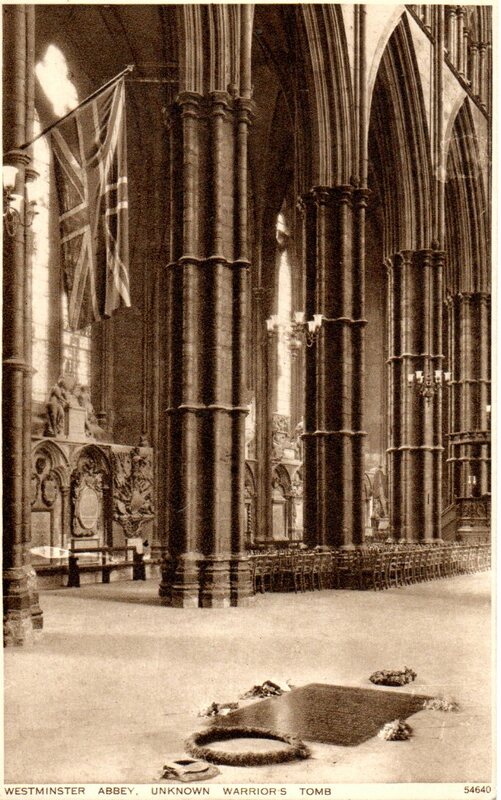 The chosen unknown was reburied in the Abbey floor on Armistice Day, November 11, 1920. Of all the graves in the Abbey, this is the only one upon which it is forbidden to step. Flowers or wreaths often surround it. This entry was posted in Cemetery of the Week, Church burial and tagged English cemeteries, London cemetery, medieval cathedrals, medieval tombs, royal tomb, sculpture, statuary, Westminster Abbey. Bookmark the permalink. I wish I could have photographed in there. It is an amazing place!